[Stride]-Stride Step-[Choose one or more cards with the sum of their grades being 3 or greater from your hand, and discard them] Stride this card on your (VC) from face down. 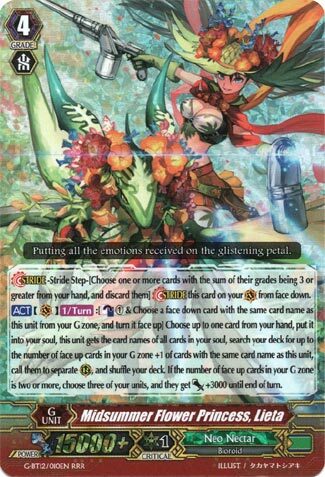 [ACT](VC)[1/Turn]:[Counter Blast (1) & Choose a face down card from your G zone with the same card name as this unit, and turn it face up] Choose up to one card from your hand, put it into your soul, this unit gets the card names of all cards in your soul, search your deck for up to the number of face up cards in your G zone +1 of cards with the same card name as this unit, call them to separate (RC), and shuffle your deck. If the number of face up cards in your G zone is two or more, choose three of your units, and they get [Power]+3000 until end of turn. As if G-Zone space for Neo Nectar wasn’t tight enough. Now functionally this isn’t terrible, since being able to clone from nothing but the soul helps in not requiring a field (they’re lucky the 1-to-soul from hand is optional otherwise this would probably get dropped), it’s a straight +2 as a first Stride as long as you lose nothing from the hand), but truthfully, this has not much utility except in Bloom, as field filling plus a slightly more powerful column on GB3 is really all it offers. Musketeers could also use this I guess, they were never a real column deck and any way to generate field outside of +0 washes is welcome. Loses points for not being Battle Phase calling, but good for getting a decent board going if sacked. Can be ignored otherwise safely. This card gives Neo Nectar yet another option for cloning units, this time copying from the soul instead of needing anything specific on the field. Because of this card’s ability to give you a field even when your field may have been wiped out as well as free you of the need to worry about losing units by riding them, this will be a common card to find in Neo Nectar decks.